The works of Kaneuji (兼氏) can be broken down into several categories depending on where he was living and studying. His earliest works are thought to have been signed with these kanji, 包氏, and were done in pure Yamato Tegai workmanship. Unfortunately, no works remain with this signature. Upon moving to Shizu (志津), he changed the first character “Kane” from 包 to 兼 thus using the form of the character that we today call the “Mino Kane”. There is a signed tachi that once belonged to the Ikeda family in Otsuka that is done in the Yamato style of workmanship with the signature (兼氏). Unfortunately, since Kanuji (兼氏) worked during a time when very long swords were the norm, today we have mostly o-suriage mumei katana. There are enough zaimei tachi, however, to allow sword scholars ample material to form solid opinions as to the changing work styles of Kaneuji (兼氏). Also, a good number of signed tanto survive to further support this research. I would like to make a short digression to clarify the terms used to describe the works of Kaneuji, i.e. Yamato Shizu (大和志津), Shizu (志津) and Naoe Shizu (直江志津). 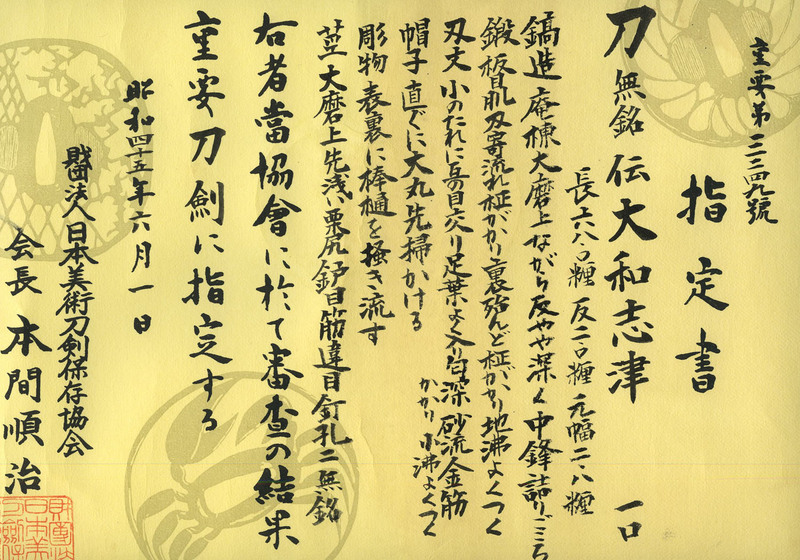 The term Yamato-Shizu refers to Shizu Saburō Kaneuji (志津三郎兼氏) from before his studies with Sōshū Masamune and when he signed his name with the homonymous characters (包氏). In addition, the term is also applied to smiths who continued to work in Yamato under the Kaneuji (包氏) name during the Nanbokuchō period. After leaving Yamato, Kaneuji (兼氏) moved to Mino and settled down in Shizu (志津). Hence we often refer to him simply as Shizu (志津). 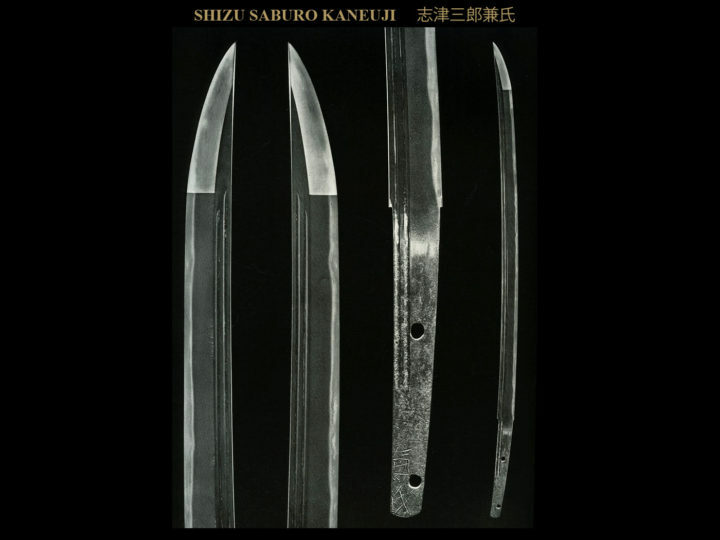 In all cases when we are using the term Shizu (志津), we are usually talking about Shodai Shizu Saburo Kaneuji（志津三郎兼氏). 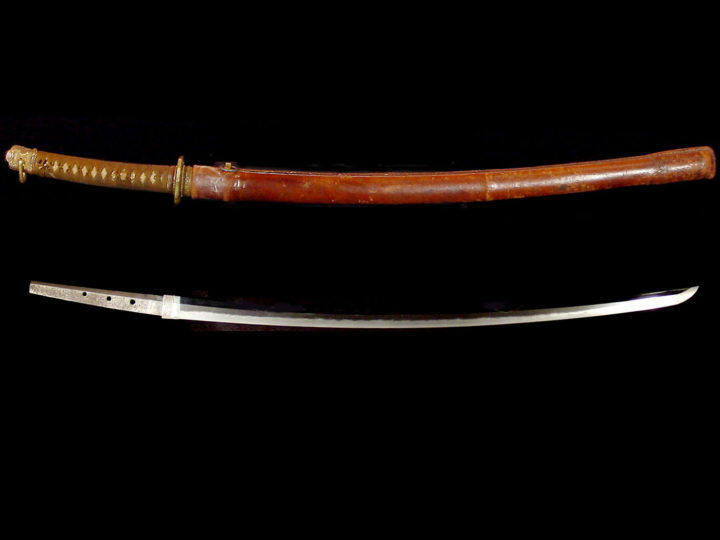 Katana, Unsigned; den Yamato Shizu (大和志津). Measurements: Length: 68.0 cent. 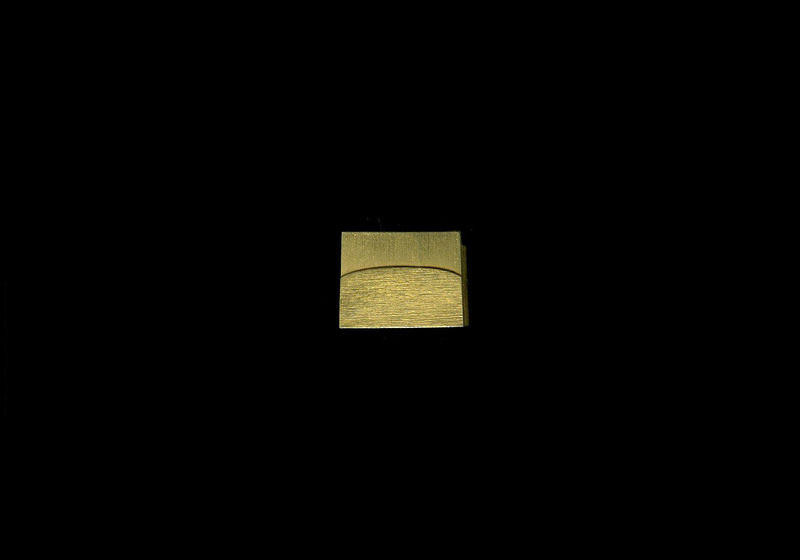 ; Curvature: 2.0; Width at Base: 2.8 cent. 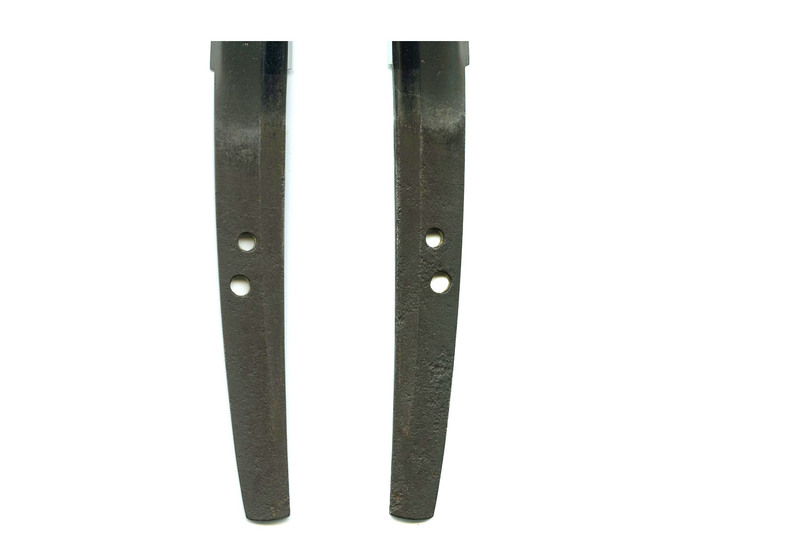 ; Width at Point: 1.9 cent. 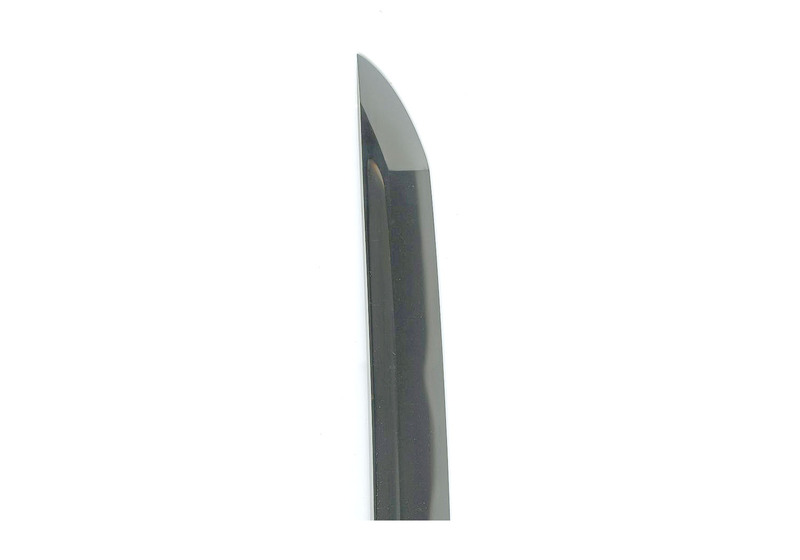 ; Length of Point: 3.2; Nakago Length: 16.0 cent. ; Nakago Curvature: 0.2. Characteristics: The construction is shinogi-zukuri with an iori-mune. 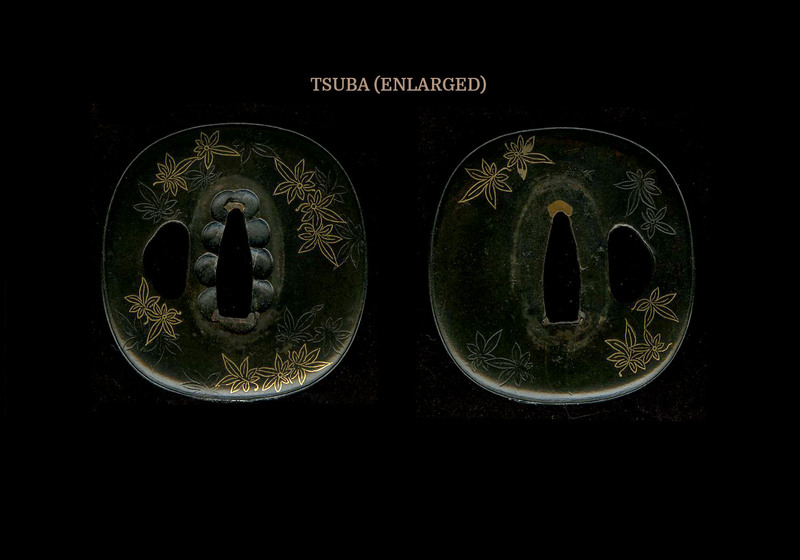 Although the blade is ô-suriage, the curvature is rather deep, and the kissaki is medium sized with a stubby feeling. The kitae is itame-hada with flowing masame near the ha, and the ura is almost entirely masame. The entire jigane is well covered in ji-nie. 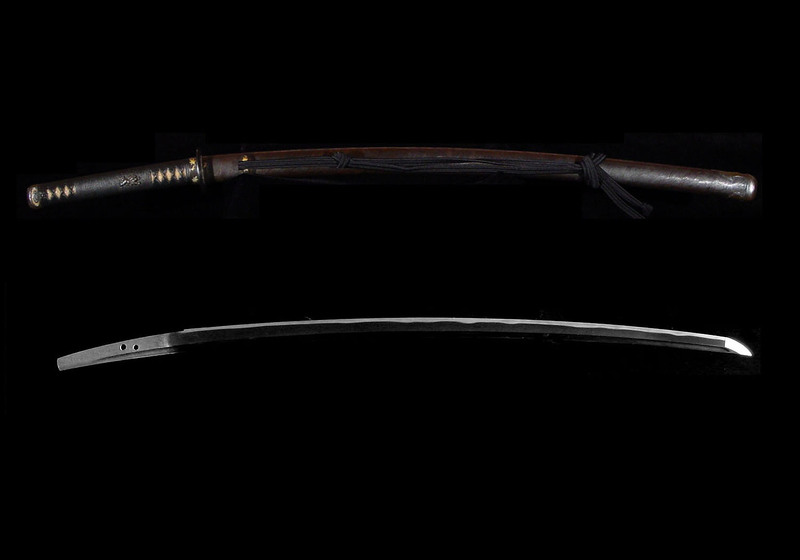 The hamon is ko-notare mixed with gunome. There is a great deal of ashi and yô activity. The nioi is thick and there are streaks of sunagashi. There is kinsuji activity and the habuchi is well covered in ko-nie. The bôshi is sugu with an ô-maru and brushed tip. There are bôhi carvings on both sides of the blade that tapper off onto the nakago. 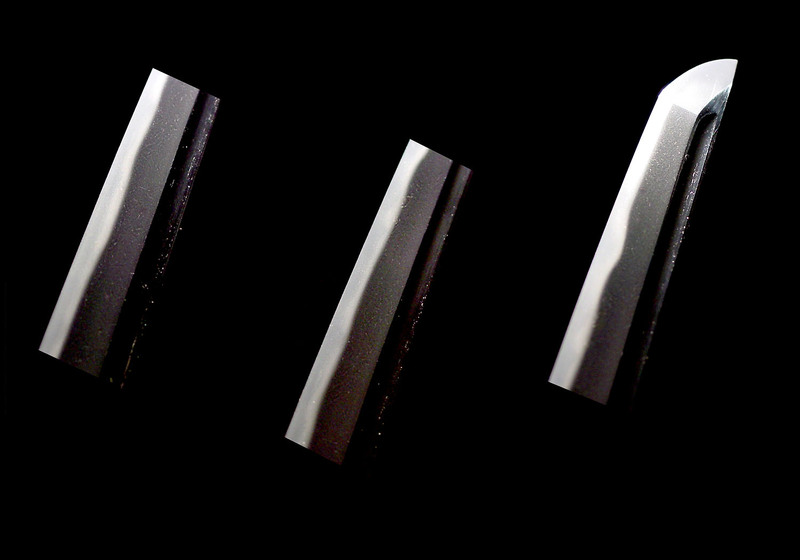 The nakago is ô-suriage, the tip is shallow kurijiri, and the yasurime are sujikai. 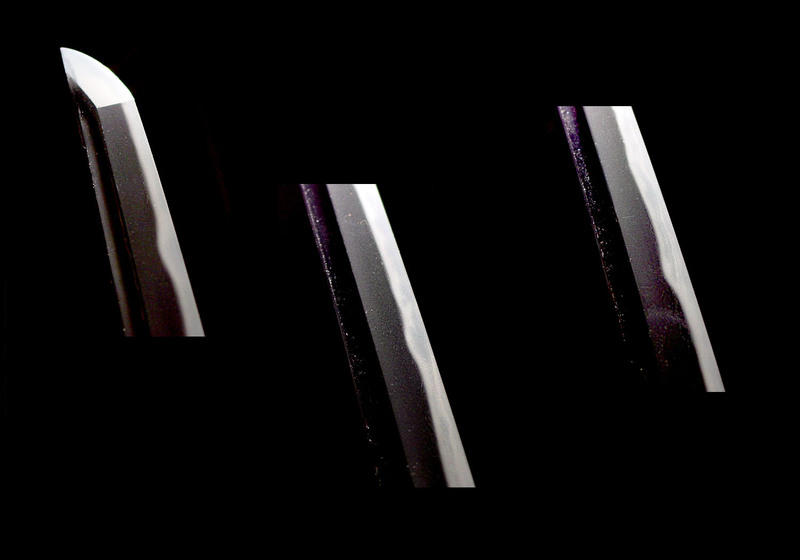 There are two mekugi-ana, and the blade is unsigned. 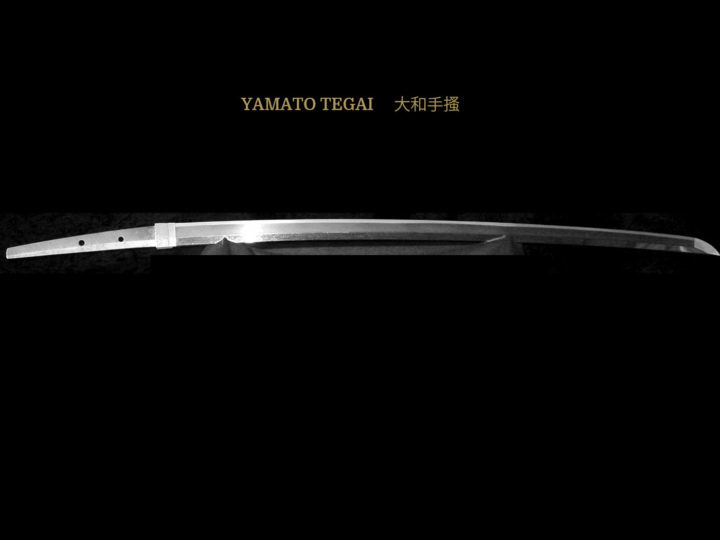 Explanation: This is an ô-suriage katana that is attributed to Yamato Shizu. 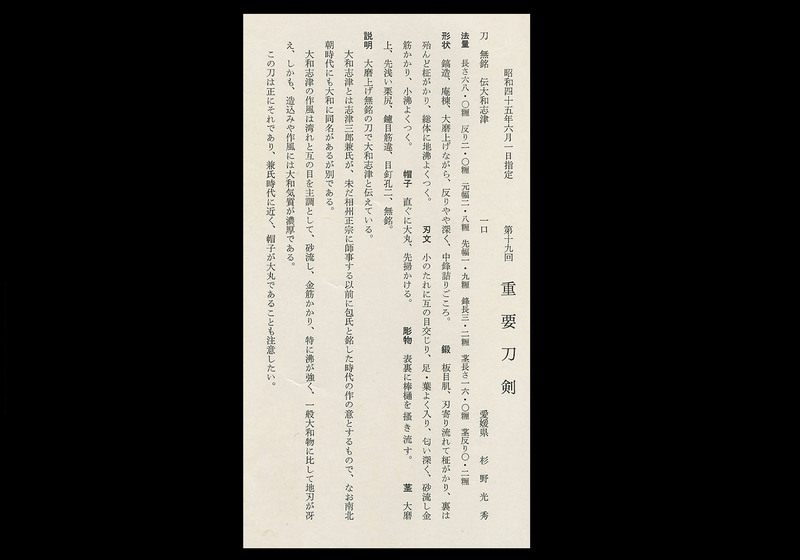 Regarding Yamato Shizu, this designation refers to those works produced during the period that he signed Kaneuji (包氏), which was before he signed Shizu Saburô Kaneuji (志津三郎兼氏) and studied under Sôshû Masamune (相州正宗). Moreover, these works differ from the Nambokuchô period smiths with the same signature Kaneuji (包氏) residing in Yamato. 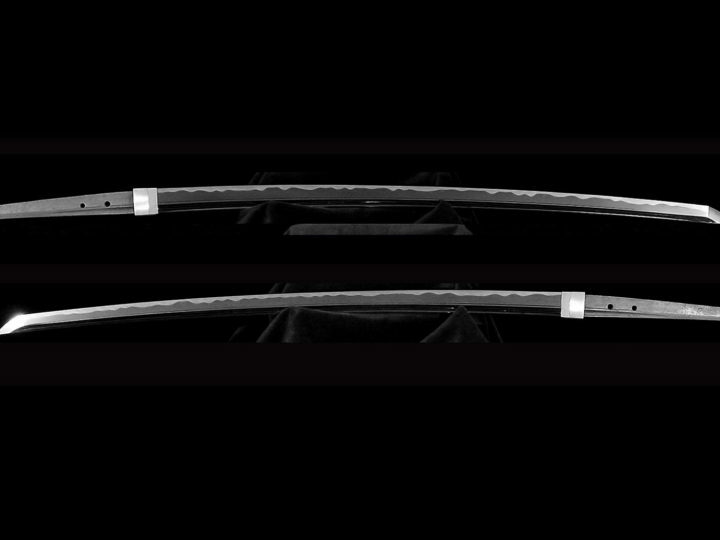 The Yamato Shizu style of workmanship is essentially a notare-gunome hamon with streaks of sunagashi, kinsuji activity and a particularly powerful nie covering. In comparison to Yamato works, the ji-ha is more vivid; however, the construction and the style of workmanship have a conspicuously Yamato appearance. 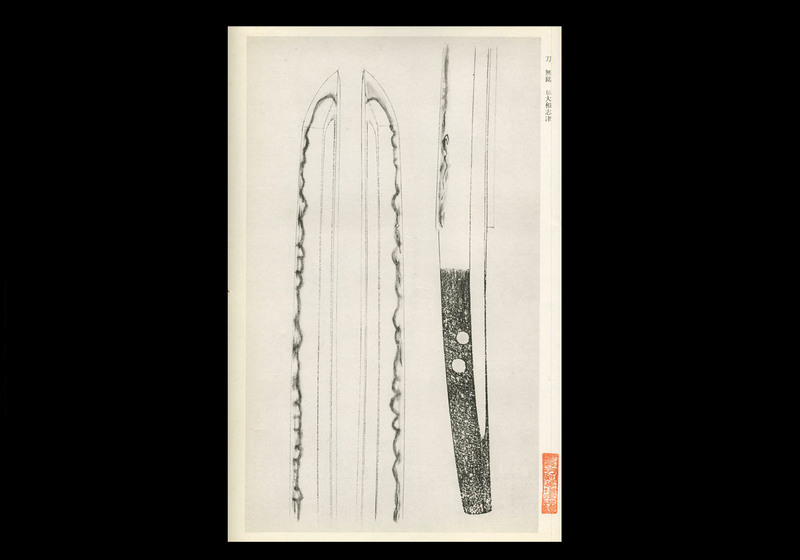 This sword truly has these Yamato characteristics; however, it is also a work that is close the works of the Kaneuji (兼氏)period. The ô-maru bôshi is also something to which I want you to pay attention. 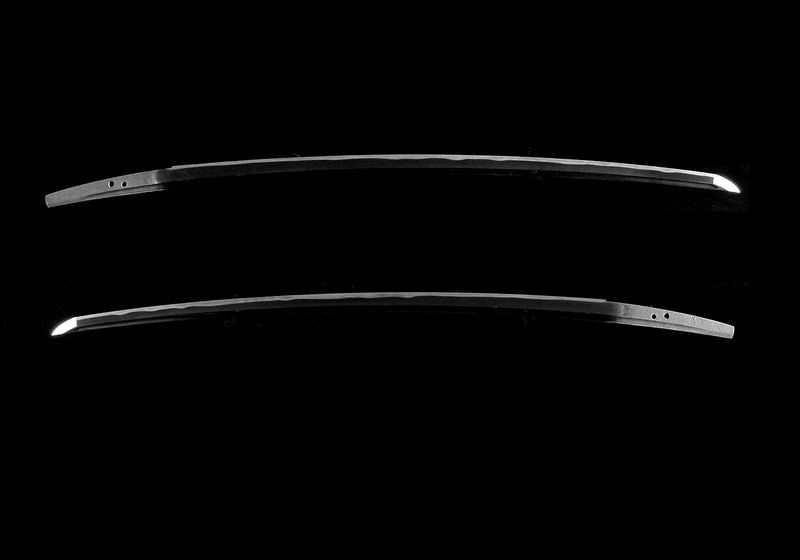 The blade comes in an old shirasaya with a sayagaki by the famous Kanzan Sato, one of the founders of the NBTHK. It has a two-piece gold foil habaki and is in perfect polish with no problems or flaws of any kind. 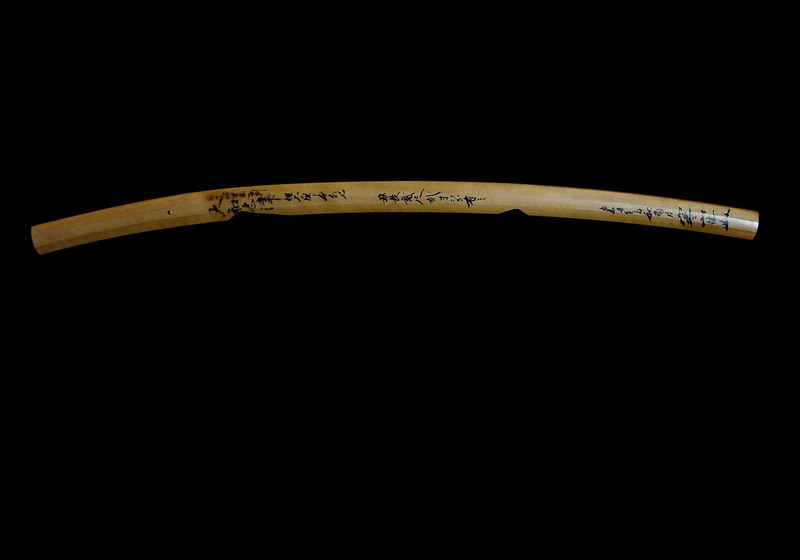 It is accompanied by a very striking koshirae of the late middle to later Edo era. The saya is lacquered in black and done in a brushwork design. There are a few very minor losses to the lacquer around the kojiri. The menuki are shishi lions done is shakudo. 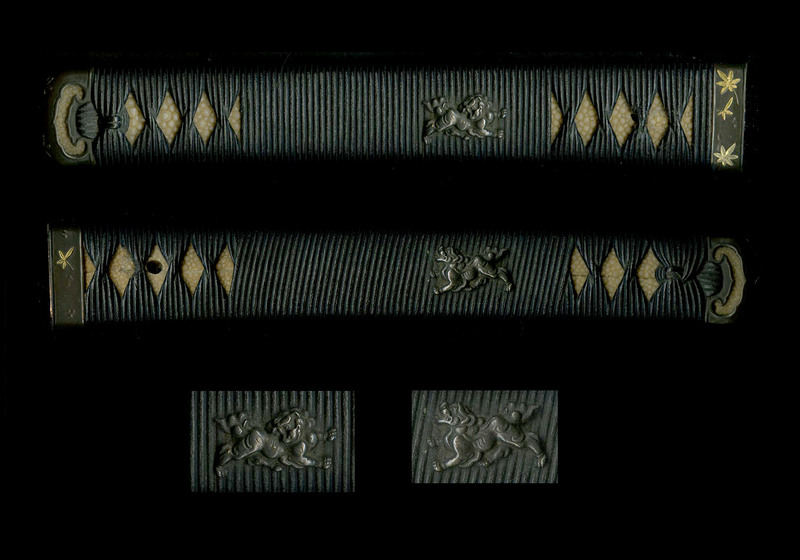 The tsuka ito is comprised of thin leather strips that are done in what can be called the katatemafi (battle type) of pattern. The leather has been lacquered black and is in a wonderful state of preservation. 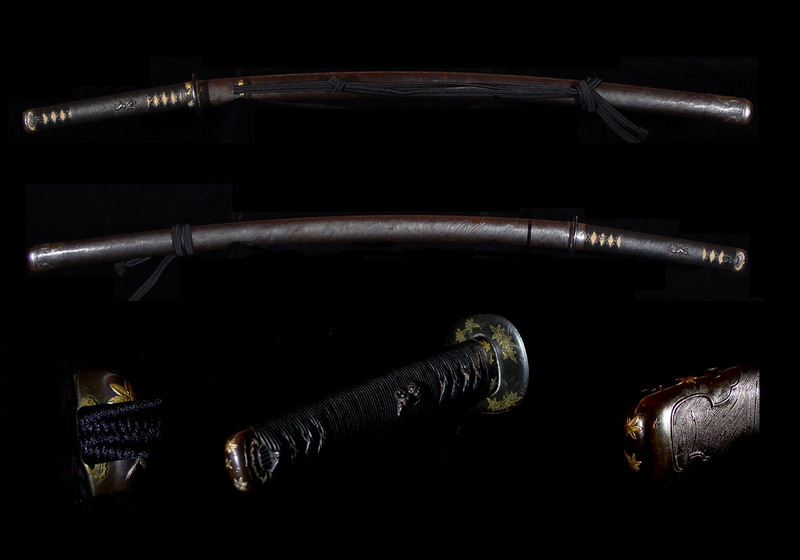 The balance of the metal parts of the koshirae (fuchi, kashira, tsuba, koiguchi, kurikata, and kojiri) are all made of shibuichi background with gold maple leaves. The tsuba is especially nice with the maple leaves done in kebori with some of them filled with gold and some left in their natural carved state. Probably Kaga goto work.